These days ADA compliance (Americans with Disabilities Act – www.ada.gov) is an absolute must for all business owners. Making sure you’re in compliance with these ADA regulations is not tricky, but very specific. There are certain ways properties have to accommodate the disabled and we are intimately familiar with those regulations. State and/or local inspectors will make certain that all ADA compliance regulations are met. Improper installation will result in delaying the occupancy permit. If you are in need of ADA compliance consultation, improvements or installation, we are your ADA experts. 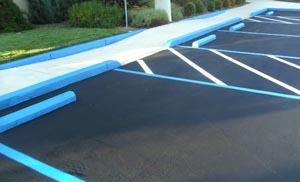 Contact American River Striping at 866-592-3356 or fill out the form on the right for a free, no obligation consultation for our ADA compliance services.